Increase tire life by making sure your wheels are in alignment. Wheels will go out of alignment under normal driving conditions, but this will be accelerated by excessively running into bumps and curbs. If you are experiencing uneven tire wear, go to a MechanicNet.com shop equipped to handle alignment problems and have your alignment adjusted. 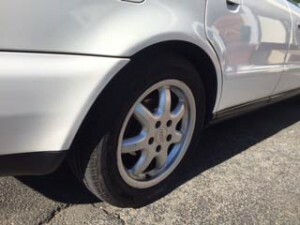 Each tire wears differently because of its position on the car. For even wear on all tires, they must be “rotated” or their positions must be swapped regularly. Rule of thumb: you should rotate your tires every other oil change or approximately every 5,000-8,000 miles. For best performance and longest life, keep your tires properly inflated based on the manufacturers specifications (32 psi on average). Overinflation causes excessive wear down the center of the treads while under-inflation causes excessive wear at the edges. You can usually find the proper inflation level on the inside of the driver’s side door of your car. Have your Playa West Automotive mechanic check your wheels and tires if you find that you are having problems that you just aren’t able to take care of yourself.